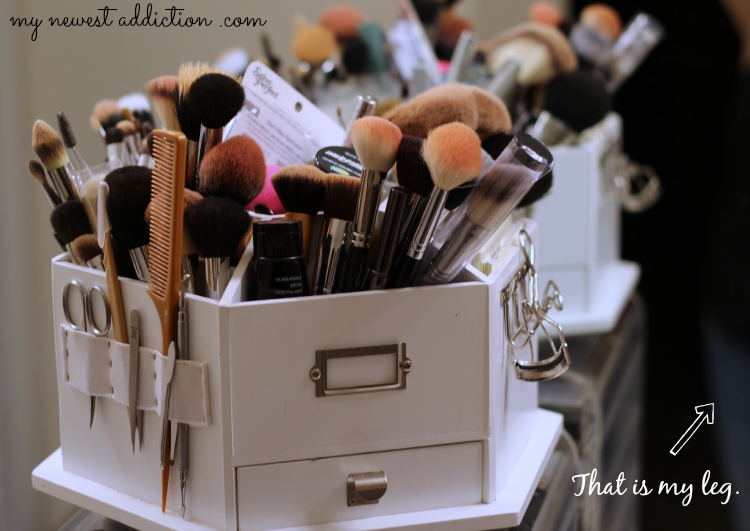 My last couple of years I have been living in an unorganized beauty product hell. 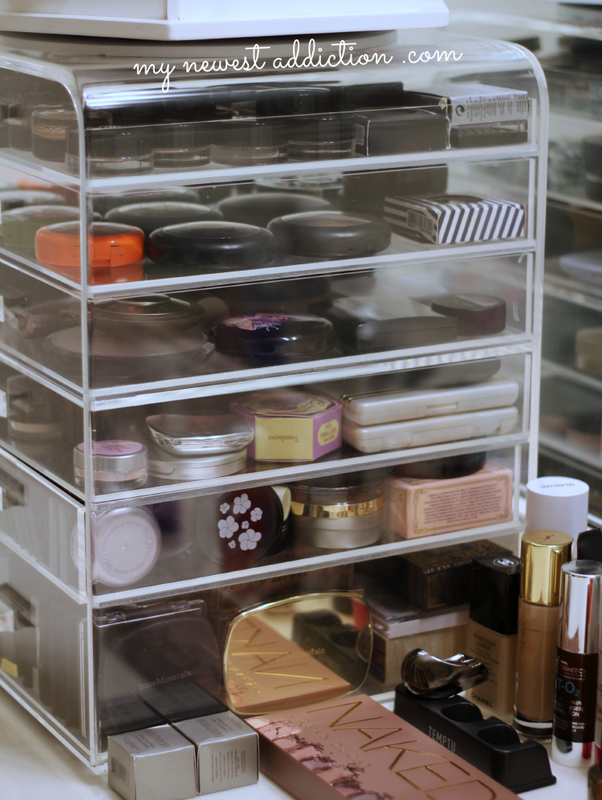 I have been searching and searching for the perfect (for me) organization unit. I wanted to be able to see everything because as you know: out of sight, out of mind! I also need a large unit because I have so much stuff that just doesn’t fit well into most spaces. I was thrilled when I found eDiva. There are two versions of the eDiva, the Duchess and the Princess. The one I am showing you today is the larger of the two, the Princess. As you can see from the photo, you have a full shot of your collection at a glance. When you are stuffing things in drawers and shuffling this and that around things get lost. It is very important for me to get use out of my entire collection. I realize that I have enough stuff to last me 20 lifetimes, but I like all of it. I wouldn’t have bought it or keep it around if I didn’t intend to get use of it. This helps me use my collection by putting it in plain sight. The eDiva Princess is awesome because there are 6 drawers so you can separate stuff out super easily, and they even come with free adjustable grid dividers. I didn’t personally use them because I got more use out of the room by not including them. The dimensions on this baby are: 12″ wide X 12″ deep X 16″ high. That is a whopping 2,304 cubic inches! Lots of room for everything! Really quickly I am going to take you through my organizer drawer by drawer. 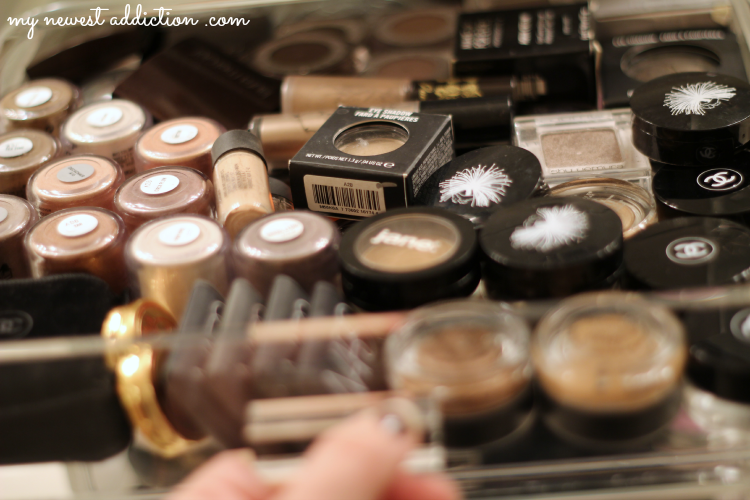 In the top drawer I have all of my favorite individual eyeshadows. 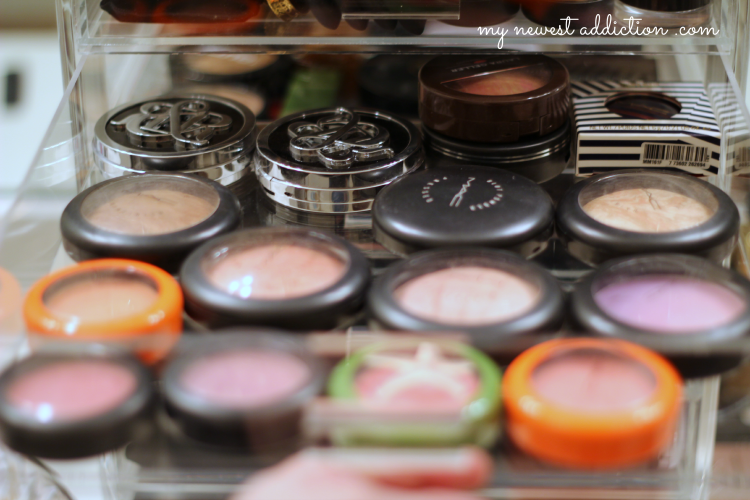 I bet you are thinking, “Your favorite single eyeshadows? That is a ton, how are they your favorite?” Yes, they are my favorite. 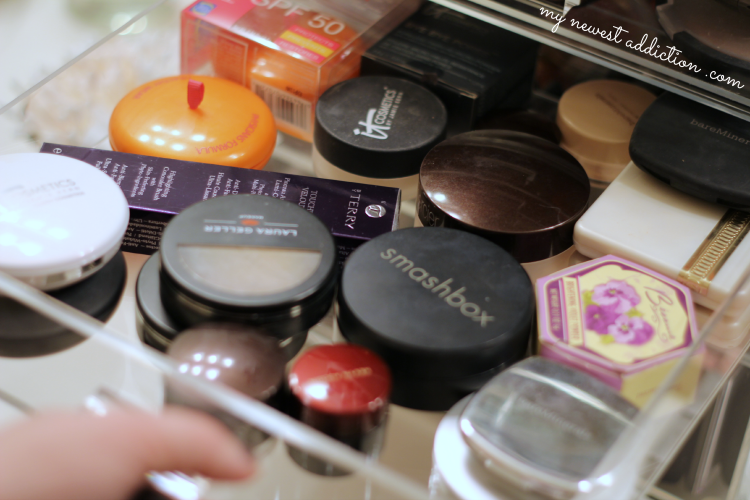 I have a ton of stuff that I have been collecting over a long period of time, my less favored products were put in a drawer unit that I store in the cabinet under the sink. I selected my favorite shades (which happen to be mostly neutral, wearable shades) and placed them in an area I can get to them quickly. 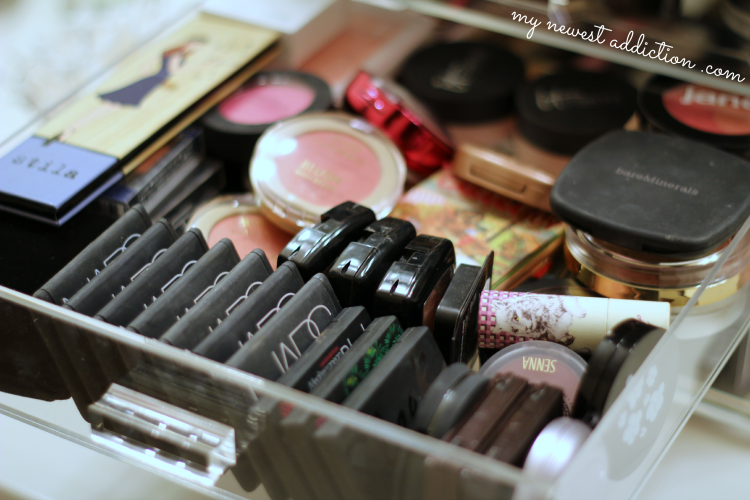 The 2nd drawer contains my larger packaging blushes, which happens to be mostly MAC MSFs. Because my MSFs were all in one drawer I decided to include my MAC blushes in that same drawer because I felt like it was smart to have similar brands grouped together. 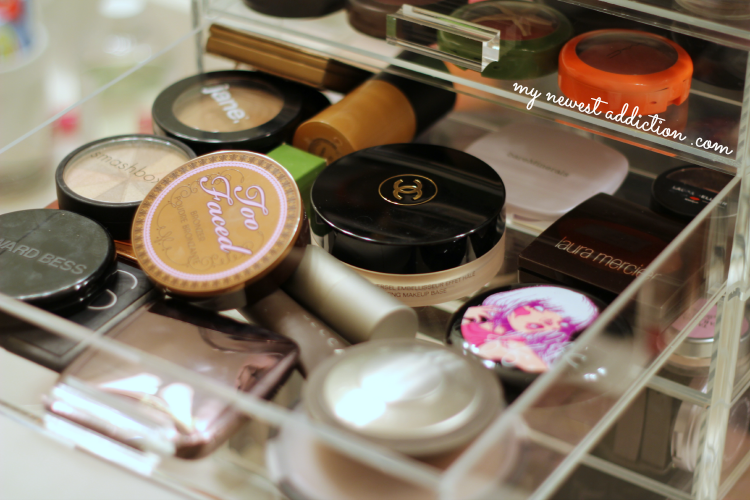 My 3rd drawer contains bronzers and highlighters. 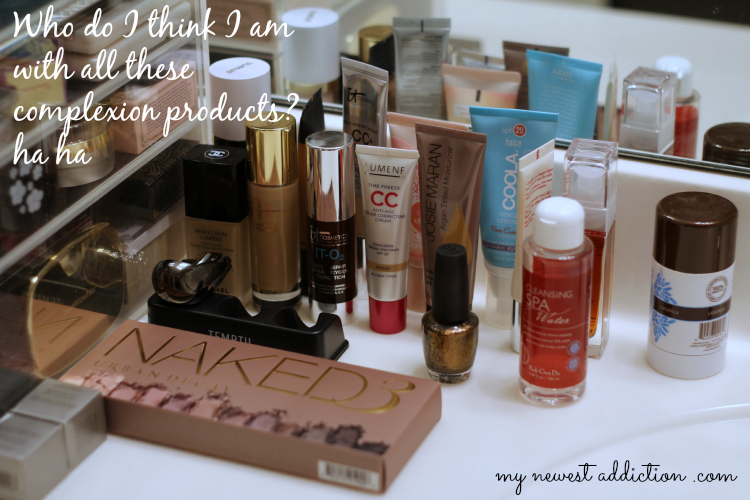 I was a kind of astonished whenI realized just how many of my products fall into this category. I honestly haven’t been highlighting and contouring much lately and when I realized I had all of these products that were hidden away I remembered just how much I enjoyed it. Why did I ever stop contouring? Part of it could be postpartum laziness, but another reason could be due to the lack of organization and ability to find what I wanted before. With this setup I have a clear look at all of my stuff. 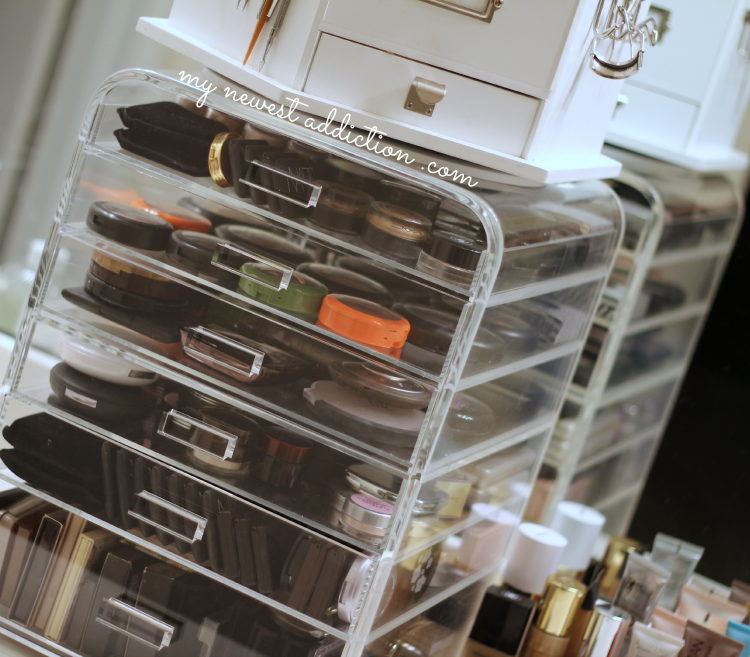 The 4th drawer contains my face powders and concealers. I have a lot of face powders and I keep them all because they each give different finishes. I have multiples of a few things because my skin color changes drastically from winter to summer, so I need to be able to accommodate. The 5th drawer houses all of my other blushes. This drawer still needs to be sifted through a bit because there is a lot of stuff stacked on top of each other. I don’t mind as much about that in this unit because I can still see the stacked items from the side. In the 6th and final drawer I have all of my eyeshadow palettes. 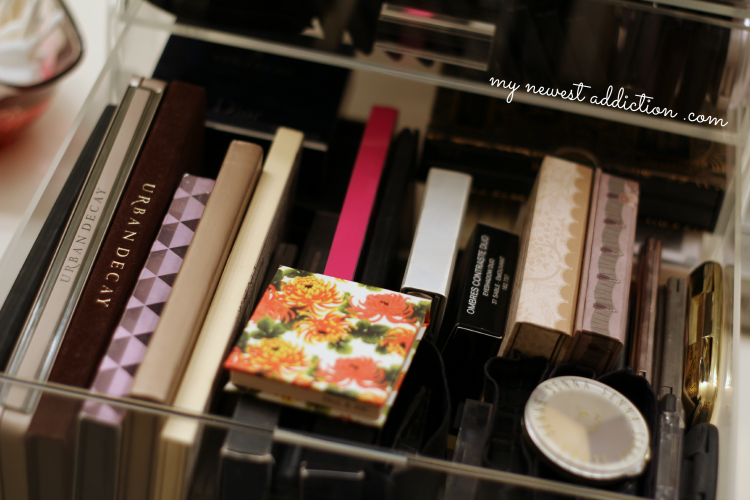 They are in this drawer because it is a deeper drawer and it allows most of my palettes to sit up on their side so I can see what they are. One thing I wish that more palettes did was put the name of it on the spine. This is a shot of several different palettes and the ONLY ones that have a name on the side are from Urban Decay. 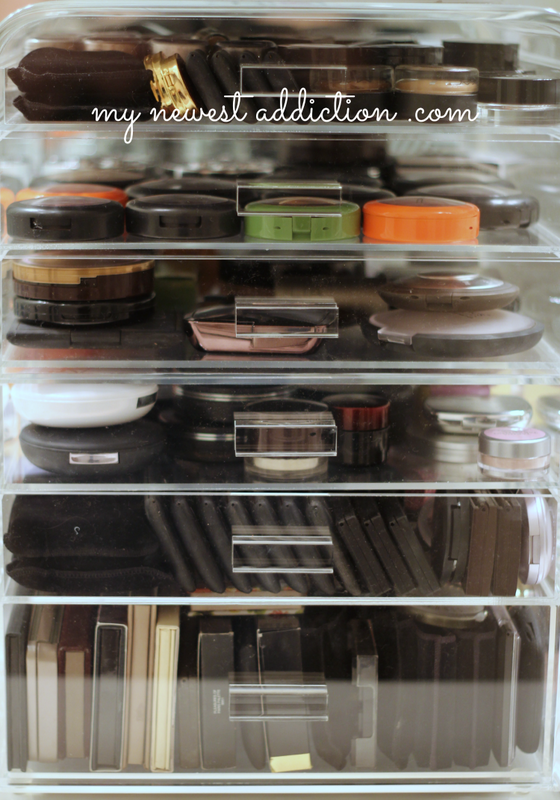 Maybe they don’t expect the average makeup lover to own so many palettes, but there are lots of us out there that could benefit by having these labelled like a book. 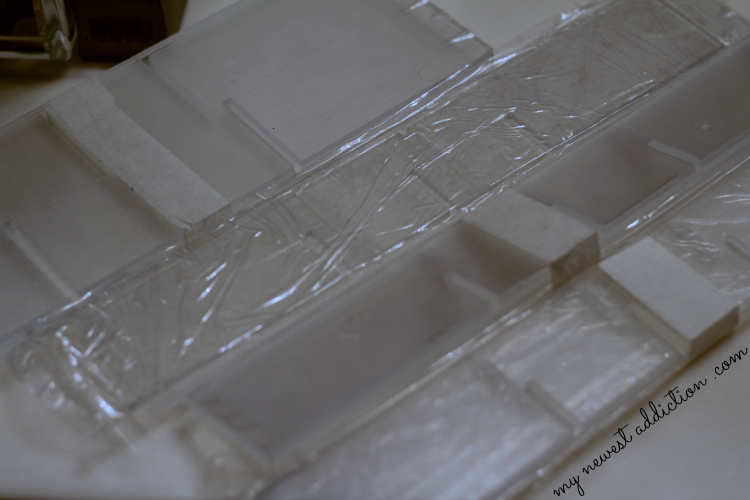 So, all of that makeup in one clear cube of acrylic gets pretty heavy. It is easy to suspect that the box may not be up to the task of withstanding that pressure. I have seen several other units like the eDiva that are much thinner and seem to buckle and break under the weight. Some don’t actually break but they warp and distort from the original shape. The eDiva has a thick structure that is completely sturdy. It is of the highest quality. It doesn’t make any creaking noises or shift around when opening and closing drawers. Speaking of drawers, these open and close smoothly. One of the things I noticed in other clear containers is that they snag or squeak or get stuck when opening and closing. These go in and out smoothly. No jamming. Another thing I want to point out is that the edges of this unit are smooth and rounded. The appearance is pleasing to the eye and you won’t hurt yourself on it. These are the actual drawer dividers that were included. There is a set for the deep drawer, as well as 3 other sets for the shorter drawers. 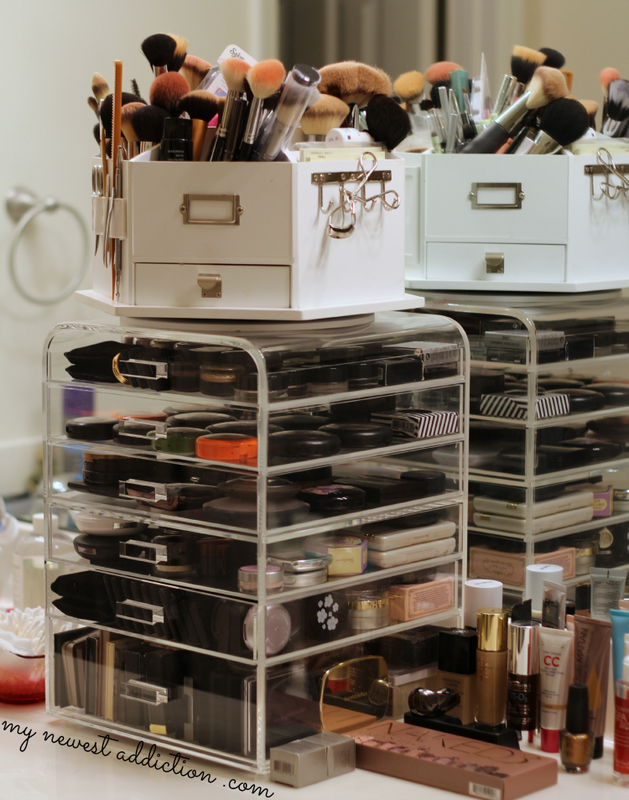 I like that my brush caddy sits nicely on top of the unit which leaves me even more counter space. I actually bought this caddy from Michael’s a white back. It is a craft organization caddy but easy holds lots of brushes and other tools. I even stash lashes, lip products, eyeliners, and mascaras in it. I mentioned that I have a lot more freed up counter space. I love that I can sit all of my foundations, tinted moisturizers, BB and CC Creams out on the counter for easy access. I love seeing them all out in the open because I can easily all the products and that can easily inspire a look I could be going for. There are also skincare products sitting out in the open for easy access, like serums, makeup removers, etc. I also like to have new products sitting out in the open too. I don’t want to tuck them away if I haven’t had a chance to play with them. Whatever latest beauty product I am testing out will usually be sitting on my counter so that I can grab it quickly. I have no gripes about the eDiva. It retails for $297 which is right on point with all of their competitors. The eDiva is a better choice than their competitors for lots of reasons. It has a better design, is more sturdy, and is more beautiful. Now that I am a mother of two (one of which is an infant) I have NO TIME to get ready in the morning. When I do have the chance to put some makeup on I can’t dawdle. 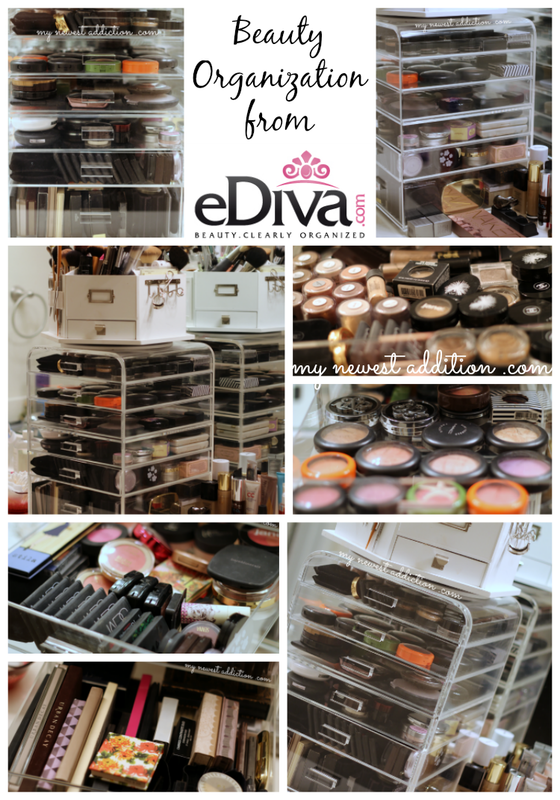 I love that the eDiva Princess allows me to see and find everything quickly, keeps my makeup organized, keeps my makeup CLEAN and dust free, and it also is pretty to look at. I honestly enjoy walking into my makeup area and seeing it housed so nicely. It literally puts a smile on my face. It also feels good to be organized. If that was one of your New Year’s Resolutions then you really need one! 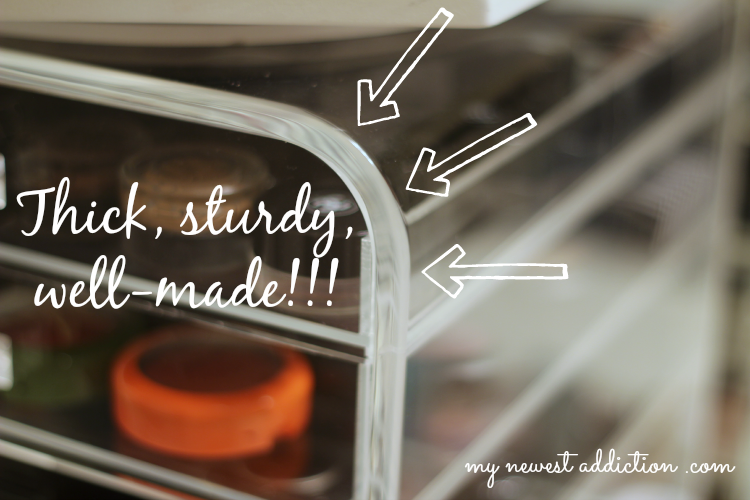 I give this clear drawer organization unit a 5 out of 5! Perfection! Thank you eDiva for such a fabulous product!